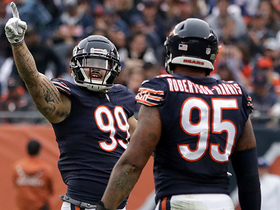 Analysis: Lynch appeared in 13 games with the Bears last season, including three starts, while notching 16 tackles, three sacks and one interception. The 26-year-old linebacker appears primed for a similar rotational role behind Leonard Floyd in 2019. Lynch missed the final three games of 2018 due to a sprained right elbow but is expected to make a full offseason recovery without undergoing surgery. Analysis: Lynch sprained his right elbow in mid-December and ultimately sat out the final three games of the Bears' season, including the team's playoff loss to Philadelphia. However, the notion that Lynch won't require surgery suggests the linebacker isn't dealing with a long-term injury. 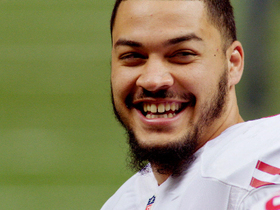 That's good news for Lynch, who is scheduled to become an unrestricted free agent at the end of the league year. 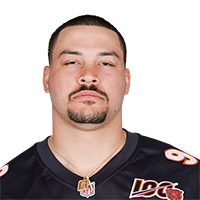 Analysis: Lynch signed a one-year deal with the Bears last March, and missed the final two games of the regular season and the wild-card loss to the Eagles due to the elbow sprain. The 25-year-old seems as though he should be ready for Organized Team Activities in the spring, but which team that is with remains to be seen. Analysis: Lynch is nursing a sprained right elbow, the severity of which caused him to miss Chicago's final two regular-season games. The depth linebacker appears to be trending towards sitting out versus the Eagles, in which case James Vaughters could be called upon to take rotational snaps. Analysis: Lynch missed the final two regular-season contests with a sprained right elbow and is now in jeopardy of sitting out Sunday's wild-card matchup with the Eagles. What the reserve linebacker is able to do over the next two days of practice will likely determine his availability for the weekend. Analysis: In limited action, Lynch showed why the Bears brought him in this season as a pass rusher by posting a sack for every 118 snaps. He'll be an unrestricted free agent this offseason, but unless he gets a starting role, he won't be a player to target in IDP leagues. Lynch (elbow) was downgraded from doubtful to out for Sunday's game against the Vikings. Analysis: Lynch did not travel with the team to Minnesota as he will unsurprisingly sit out the regular season finale. The 25-year-old will have at least one more week to recover from the elbow sprain with the Bears still attempting to improve their playoff seeding. Lynch (elbow) is officially listed as doubtful for Sunday's game against the Vikings, Dan Wiederer of the Chicago Tribune reports. Analysis: Lunch sat out last week's win over the 49ers due to an elbow sprain and is trending towards remaining sidelined Week 17. Though a first-round bye is on the line this weekend in Minnesota, the Bears are likely to focus on getting Lynch healthy for the playoffs. Lynch (elbow) was downgraded from doubtful to out for Sunday's game against the 49ers. Analysis: Lynch suffered the elbow sprain in last week's win over the Packers and was unable to practice this week. The Bears originally listed him as doubtful on Friday's injury report, but he is not traveling with the team to San Francisco. Lynch (elbow) is listed as doubtful for Sunday's game against the 49ers. Analysis: Lynch hasn't practiced in any capacity this week, so it's unlikely he'll be available Sunday while he nurses a sprained elbow. The outside linebacker hasn't been much of an IDP asset this season with 16 stops, three sacks and an interception in 13 games. Analysis: Lynch was forced out of Sunday's win over the Packers after suffering a sprained elbow. If the 25-year-old is unable to rally in time to play Week 16 against the 49ers, Isaiah Irving and Kylie Fitts might see added reps as rotational edge rushers. Lynch was ruled out of Sunday's game against the Packers with an elbow injury, Patrick Finley of the Chicago Sun-Times reports. Analysis: Lynch has dealt with a number of injuries this season, and this is just the latest. Isaiah Irving and Kylie Fitts would be the most logical candidates to fill in for the 25-year-old should he miss more time. Lynch (concussion) was a full participant in Wednesday's practice, Colleen Kane of the Chicago Tribune reports. Analysis: Lynch has cleared the league-mandated concussion protocol after suffering a head injury during a Week 11 win over the Vikings. The fifth-year veteran was a full participant in Wednesday's practice, and is on track to serve his usual rotational role behind starter Khalil Mack in Week 13. Lynch (concussion) didn't travel with the team for Thursday's game at Detroit. Analysis: Lynch suffered the concussion in Sunday's win over the Vikings so it's unsurprising he'll be unavailable for Thursday's contest. Isaiah Irving should see increased work as a rotational outside linebacker in Lynch's absence. Lynch (concussion) didn't participate in practice Wednesday. Analysis: Lynch sustained the concussion Sunday against the Vikings. It's hard to see Lynch recovering in a short week and playing against the Lions on Thursday. As long as Lynch is sidelined, Isaiah Irving is likely to see more work. 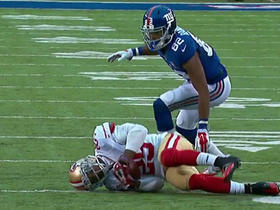 Lynch exited Sunday's game after suffering a concussion, Rich Campbell of the Chicago Tribune reports. Analysis: Lynch has seen a significant role on the Bears' defense the past few weeks but could miss some time with the concussion. It would be a surprise to see him play against the Lions on Thursday, given that concussions typically take at least a week to recover from. Look for Isaiah Irving to see some extra snaps as long as Lynch is sidelined. 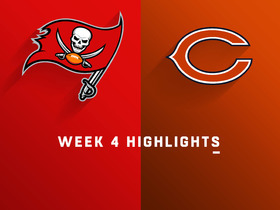 Chicago Bears linebacker Aaron Lynch leaps up and intercepts a pass thrown by Tampa Bay Buccaneers quarterback Jameis Winston. Tampa Bay Buccaneers quarterback Jameis Winston finds wide receiver Mike Evans for a 3-yard touchdown. 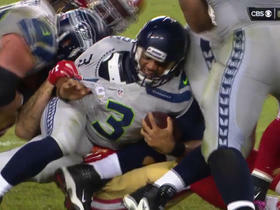 Tampa Bay Buccaneers quarterback Jameis Winston is taken down for a 4-yard loss by Aaron Lynch. 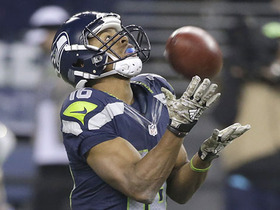 Seahawks Tyler Lockett catches pass, won't go down, and then fights his way in for a TD. 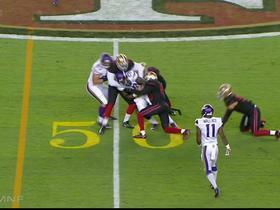 Adrian Peterson shows off his rare strength as he carries multiple defenders on his back during a run. 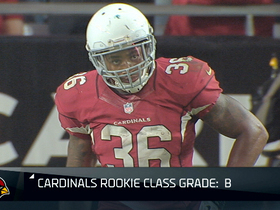 NFL Media's Bucky Brooks joins Colleen Wolfe to give out grades to the NFC West rookies for their performances in the 2014 season. 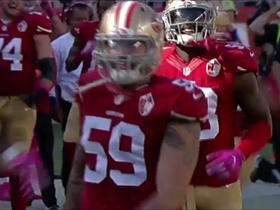 Mike Mayock takes a look at San Francisco 49ers linebacker Aaron Lynch and how he has become a playmaker. New York Giants quarterback Eli Manning throws his fourth interception of the game to San Francisco 49ers cornerback Chris Culliver.